With this Alaska Cruise Package enjoy spectacular views of glaciers and fjords in the comfort of a luxury cruise ship during a 7 or 12 night cruise. Cruise through College Fjord, rimmed with 16 glaciers named for Ivy League colleges. Spot Alaska’s wildlife including sea lions and sea otters in Prince William Sound, harboring Alaska’s greatest concentration of tidewater glaciers. By night, take in a Broadway-style show, try your luck in the casino, check out the nightclub, or read in the library aboard the luxury Alaska Cruise ship. 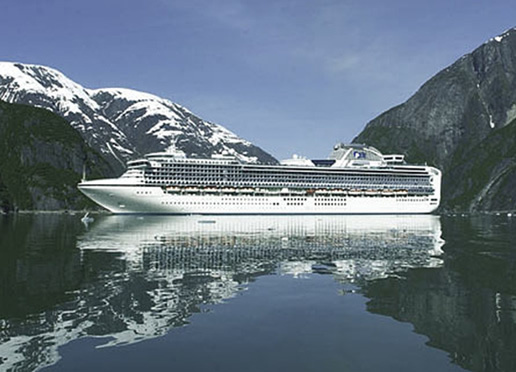 Further highlights of your Alaska Cruise will be the views of Glacier Bay National Park, with blue-tinged ice cliffs towering over the sea, where you will hear the roar when they calve and crash into the water. Look for humpback whales, orcas, seals, and seabirds. Visit historic Skagway, gateway to the Klondike gold fields, in antique cars before boarding a ferry cruise on Lynn Canal to Haines. Go rafting through the Chilkat Bald Eagle Preserve, hosting the world’s largest concentration of bald eagles. Ride the exciting White Pass & Yukon Route narrow-gauge railway built in 1898 during the gold rush. This vintage rail excursion heads up steep grades, around cliff-hanging turns, and over high bridges. Cruise to Alaska’s capital city of Juneau, set on a narrow strip of land between the Coast Mountains and the Gastineau Channel. Gather insights on the traditions of the indigenous Tlingit peoples of the Pacific Northwest during a private cultural presentation, and continue to Ketchikan, the ancestral home of the Tlingit, Haida, and Tsimshian tribes, for an inside look at the role that Tlingit heritage plays in the local culture with numerous totem poles and traditional Tlingit and Haida dances. Spectacular views of Alaska’s Inside Passage on a full day of cruising past the densely forested islands and coastal communities of this renowned waterway complete this extraordinary Alaska cruise. An Alaska Travel Package with visits to the Denali National Park and Wrangell-St. Elias National Park can be combined with this Alaska cruise package. Discover Travel - Copyright © 1998-2014 - All Rights Reserved.